This is the first pop-up card I tried to design after making the pop-up cards from Canon to research how to make one. I figured out some vital information and also which formula's I need to use to calculate to make certain shapes. I made the cutout template first using a pencil and normal paper, to make a prototype to see if its really works. 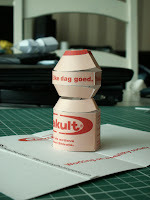 The prototype had a problem with the top part of the Yakult bottle, it wouldn't unfold back to the shape when it was flatten. But i though this was caused by the weak thin paper. But in the final version I used a thicker paper and it still don't unfold. Also try to find a way to unfold but its just too technical to get it unfold correct. But I learned a valuable lesson and maybe found the problem. 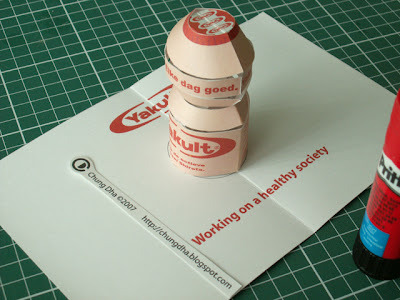 But for now a preview of the Yakult bottle pop-up. Nice work, and keep going with your interests in many media.